Astonishingly, a virus that exclusively attacks the cholera bacteria was caught having stolen the functional immune system of bacteria--and is even using it against its bacterial host. A study published on February 27 in the journal Nature provides the first evidence that this type of bacteria attacking virus, a bacteriophage ("phage" for short), can acquire a wholly functional and adaptive immune system, something that was thought to be a too complex task for the very basic and 'dumb' virus. 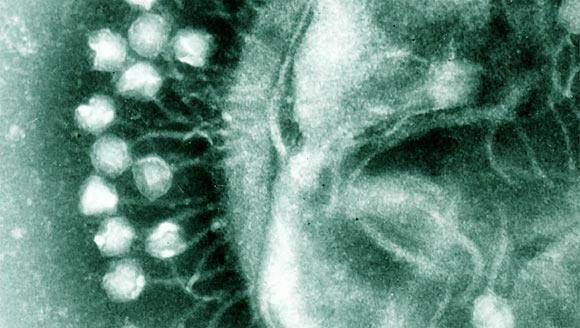 The phage used the stolen immune system to disable – and thus defeat – the cholera bacterias defense system against phages. Therefore, the phage can kill the cholera bacteria and multiply to produce more phage offspring, which can then kill more cholera bacteria. The study has dramatic implications for phage therapy, which is the use of phages to treat bacterial diseases. Developing phage therapy is particularly important because one of the most serious problems in health-care today is that more and more bacteria, called superbugs, are developing resistances to most or all current antibiotics. "The study lends credence to the controversial idea that viruses are living creatures, and bolsters the possibility of using phage therapy to treat bacterial infections, especially those that are resistant to antibiotic treatment," said Camilli, professor of Molecular Biology & Microbiology at Tufts University School of Medicine. The orthodox believe was that phages existed only as primitive particles of DNA or RNA and therefore lacked the sophistication of an adaptive immune system, which is a system that can respond rapidly to a nearly infinite variety of new challenges. Phages are viruses that exclusively attack bacteria and each phage is parasitically mated to a specific type of bacteria. This study focused on a phage that attacks Vibrio cholerae, the bacterium responsible for cholera epidemics in humans. First author Kimberley D. Seed, Ph.D., a postdoctoral fellow in lead investigator Camilli's lab, was analyzing DNA sequences of phages taken from stool samples from patients with cholera in Bangladesh when she identified genes for a functional immune system previously found only in some bacteria (and most Archaea, a separate domain of single-celled microorganisms). To verify the findings, the researchers used phage lacking the adaptive immune system to infect a new strain of cholera bacteria that is naturally resistant to the phage. The phage were unable to adapt to and kill the cholera strain. They next infected the same strain of cholera bacteria with phage harboring the immune system, and observed that the phage rapidly adapted and thus gained the ability to kill the cholera bacteria. This work demonstrates that the immune system harbored by the phage is fully functional and adaptive. "Virtually all bacteria can be infected by phages. About half of the world's known bacteria have this adaptive immune system, called CRISPR/Cas, which is used primarily to provide immunity against phages. Although this immune system was commandeered by the phage, its origin remains unknown because the cholera bacterium itself currently lacks this system. What is really remarkable is that the immune system is being used by the phage to adapt to and overcome the defense systems of the cholera bacteria. Finding a CRISPR/Cas system in a phage shows that there is gene flow between the phage and bacteria even for something as large and complex as the genes for an adaptive immune system," said Seed. Camilli's previous research established that phages are highly prevalent in stool samples from patients with cholera, implying that phage therapy is happening naturally and could be made more effective. In addition, a study published by Camilli in 2008 determined that phage therapy works in a mouse model of cholera intestinal infection.